CAN POCAHONTAS TAKE ON TRUMP? 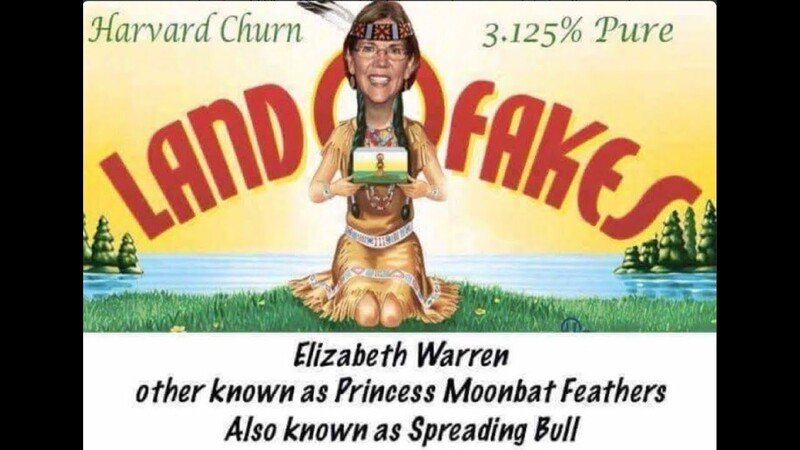 From The Hill comes the following as Democrats question whether Massachusetts Sen. Elizabeth “Pocahontas” Warren can really take on President Trump in the 2020 elections. The question is, can a far-LEFT Progressive who calls for the abolitionism of ICE really win back blue-collar Democrats from President Trump in Michigan, Wisconsin and Pennsylvania? Can a liberal Democrat elite win or even come close in a southern state? The answer is likely no on both accounts. There lies the problem for the Democrats. The problem is that the Democrat party has gone too far LEFT and is being pushed off the cliff by the likes of self-proclaimed socialist Bernie Sanders. Now you have the likes of Warren, a progressive made from the same cloth as a possible challenger to Trump to change the minds of the blue collar Dems in Michigan, Wisconsin and Pennsylvania? Hardly. In fact, Democrats might just lose the “rust belt” forever. IF YOU DON’T WANT THE FOLLOW THE RULES … SIT DOWN!!! Pocahontas, Sen. Elizabeth Warren (D-MA) was shut down during her vitriolic speech against President Donald Trump nominee for attorney General, Sen. Jeff Sessions. It appears that under Senate rule 19, No Senator in debate shall, directly or indirectly, by any form of words impute to another Senator or to other Senators any conduct or motive unworthy or unbecoming a Senator. That is exactly what Warren was accused of doing. Warren knows the rules of the Senate and as most on the LEFT believe, that they don’t apply to them. After a contentious back and forth conversation between Warren and the Senate chair, which prompted the chair to finally say … “The senator will take her seat.” BAM!!!! The headlines from the liberal media regarding this case show more pure bias. When the liberal MSM does not like the law, they call them arcane. The move means the progressive senator won’t be allowed to speak from the floor until after the Senate wraps up its debate on Sessions’s nomination, expected to occur on Wednesday evening. The drama on the Senate floor comes after McConnell interrupted Warren’s speech accusing her of breaking the upper chamber’s guidelines. A funny thing happened on the way to the 2016 Hillary Clinton coronation, maybe Hillary is not as invisible as the political pundits think as populist Lefties do not support her. A YouGov poll of likely Democratic voters for MoveOn.org and Democracy for America showed Sen. Elizabeth Warren (D-MA) ahead of Hillary Clinton in Iowa, 31 % to 24% and in New Hampshire, Warren leads Clinton, 30% to 27%. Don’t worry Hillary, there is nothing to be concerned with here, it is not as though Iowa and New Hampshire and two early and influential primary states. Oh wait, they are. Warren and her anti-business ideology is the darling of the far Left. Is Hillary Clinton too yesterday for the base of the Democrat party? Populist groups cheering “Run Warren Run,” today released 2016 election polls from Iowa and New Hampshire showing Sen. Elizabeth Warren ahead of dominant Democrat Hillary Clinton. Warren has said she doesn’t plan to challenge Clinton, though several others have indicated that they are looking at a bid, including Vice President Joe Biden and Sen. Bernie Sanders, I-Vt. The groups cautioned that the poll mostly shows that voters are extremely open to her candidacy rather than her being a Clinton killer. They hope to use the poll to encourage Warren to change her position and get into the race. 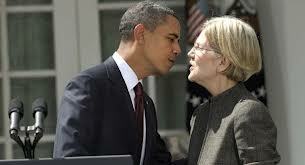 Is Barack Obama Really Privately Promising Elizabeth Warren His Support Against Hillary Clinton In 2016? In the end, is there really any difference between Hillary Clinton and Elizabeth Warren? I think not. According to a NY Post article, President Barack Obama has quietly promised Sen. Elizabeth Warren (D-MA) complete support if she runs for president. That would be quite something since Hillary was Obama’s Secretary of State and had it not been for Bill Clinton’s speech at the Democrat National Convention in 2012, Obama most likely would have not been reelected. And what about VP Joe Biden, what if he runs? However, to date Warren has claimed that she has no intention of running for president in 2016. But if she does become convinced to run in the Democrat primary, it would most likely cause a fissure in the Democrat Party and a political Civil War the likes we have not seen in years. Publicly, Obama has remained noncommittal on the 2016 race, but privately he worries that Clinton would undo and undermine many of his policies. There’s also a personal animosity, especially with Bill Clinton, that dates from their tough race six years ago. A former Harvard law professor and administration aide, Warren would energize the left wing of the Democrat Party just as Obama did against Clinton in 2008. Thanks to her outspoken stand against big banks and the top 1 percent, Warren is the darling of progressives. She won her Senate seat thanks to millions of dollars in donations from outside Massachusetts, including from rich environmentalists and Hollywood celebrities. Barack Obama’s fear is that Hillary Clinton will undo many of Obama’s policies. Really, like what? Make no mistake out it America, Hillary Clinton is as liberal, if not more than Obama. The only difference is that she at many times lies about her true colors. She is certainly even more liberal than her husband Bubba. Hillary will not undo Obamacare, she is the Grandmother of Obamacare. She has pretty much painted herself into a corner defending Obama’s policies as a senator and Secretary of State. Face it, Hillary is just as much of an ideological as Obama. She is more like Obama, than her husband Bill Clinton. If this does come to fruition, it will be more about a power-play of who has the power in the Democrat party than Obama believing Hillary will change his policies. 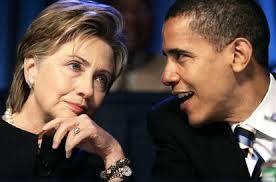 It is about the tension that still exists between the Clinton’s and Obama from 2008. However, make no mistake about it, if Elizabeth Warren does run, it will be a battle Royal for the soul of the Democrat party and all will see just how radically liberal and socialist the Democrat party has truly become.